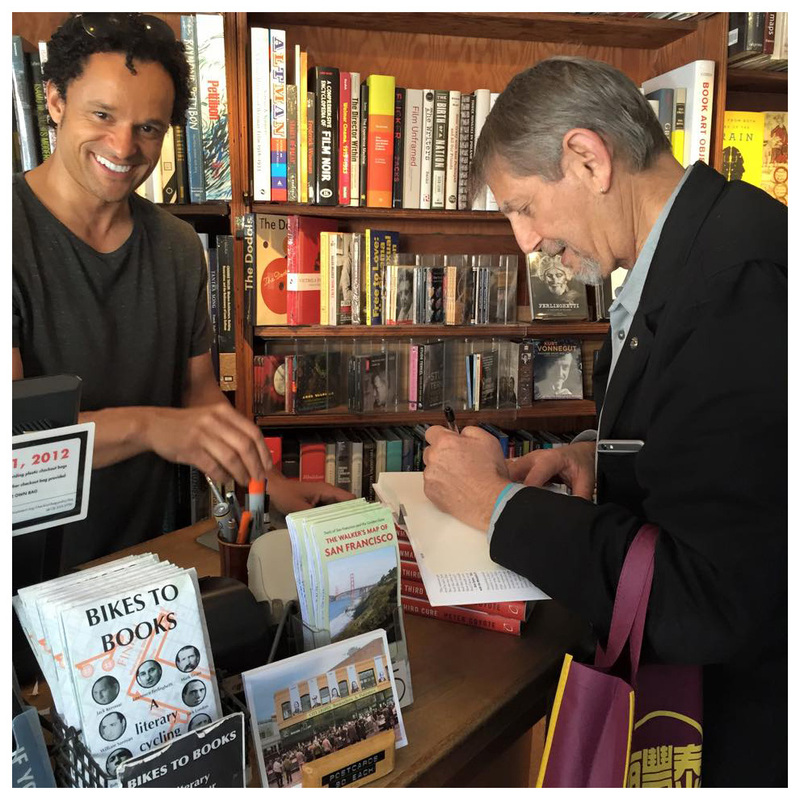 Last night Peter did a reading from his new book at Readers Books in Sonoma. 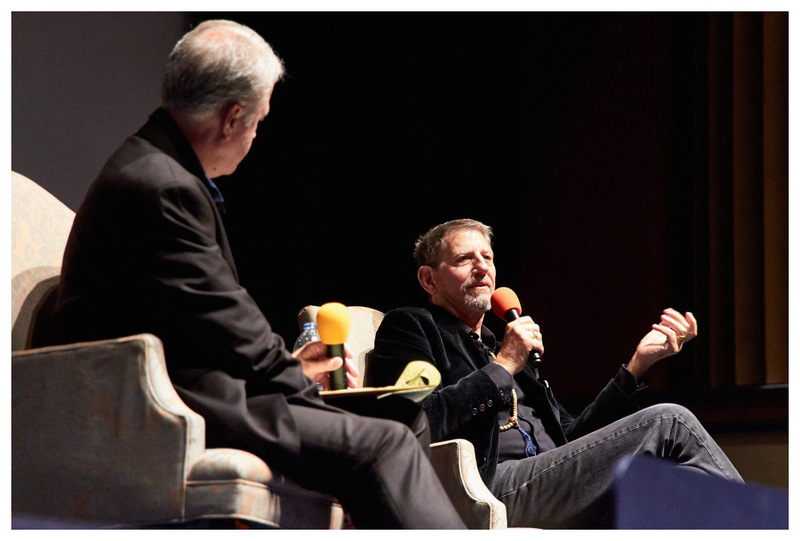 The night before he appeared at a sold-out event at the Smith Rafael Film Center in San Rafael. 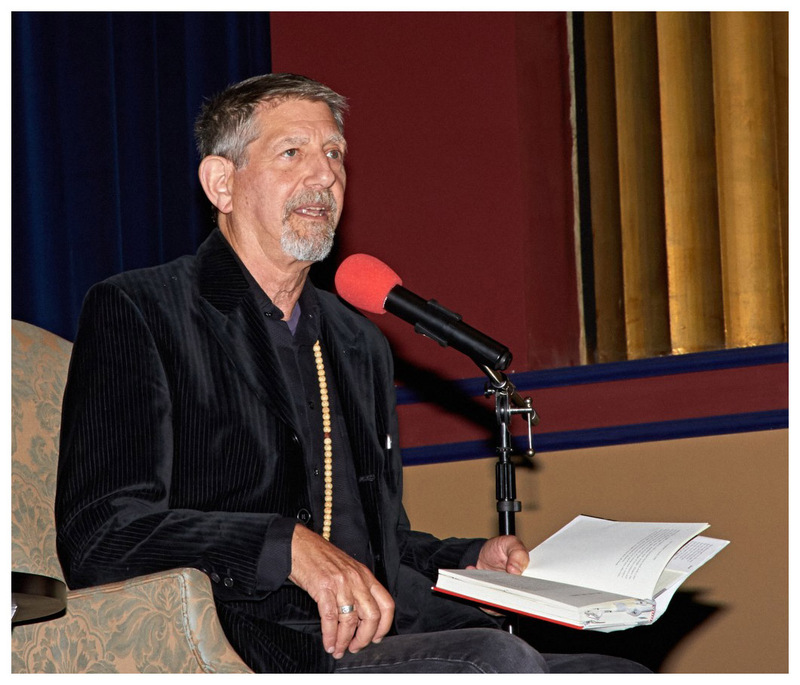 The evening included film clips of his career, a reading from his book, "The Rainman's Third Cure", and a Q&A. Peter called it "a great and lively night" with over 1,000 attending. 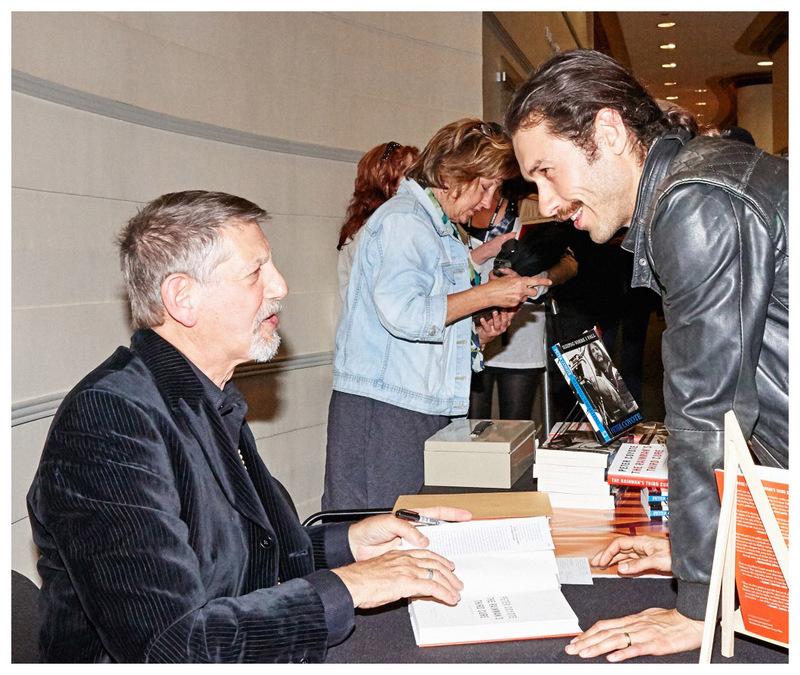 On Tuesday, May 26th, Litquake's Epicenter hosted an event called "Peter Coyote in Conversation with Phil Bronstein". 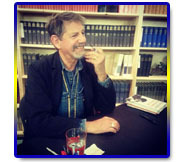 The description read "Lipquake is proud to present the San Francisco launch of Peter Coyote's latest release, 'The Rainman's Third Cure: An Irregular Education'. This spiritual biography explores the competing forces of the transcendental, inclusive, and ecstatic world of love and the competitive, status-seeking world of wealth and power. Coyote will be in conversation with Phil Bronstein, a journalist, editor, and executive chair of the board for the Center for Investigative Reporting. Audience Q&A, and book sales and signing to follow. Co-presented by Green Apple Books." For those of you who have yet to purchase Peter's book but would like to read a brief passage, you should visit this link at Tricyle.com. 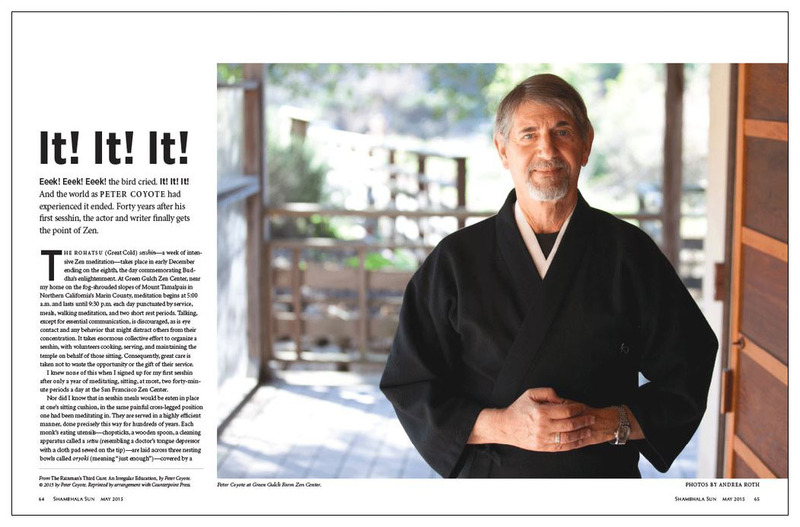 The May 2015 issue of Shambhala Sun is now available and among its features this month is Peter's thoughtful and lyrical relection upon his life in Zen. There's an interesting May 7th article written in Beyond Chron by Suzanne Gordon that gives an overview on both of Peter's memoirs. She writes, "What these two books highlight is that spirituality and political commitment are not mutually exclusive choices. What Coyote’s life story teaches us is that making peace with one’s inner demons can even lead to a deeper and richer engagement with efforts to change the world." Read the full article at this link. 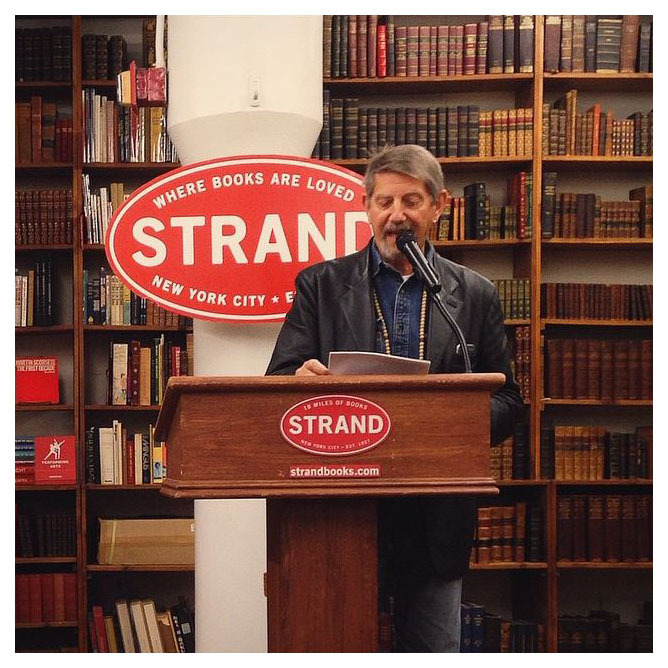 On April 23rd Peter was a guest on The Leonard Lopate Show on WNYC Radio. He discussed his on-screen career and some of the memorable experiences and mentors that informed his career, as well as his spiritual practice. He also talked about a few of the things he likes to read, watch and listen to in his spare time. Q: What have you read or seen over the past year (book, play, film, etc...) that moved or surprised you? PC: Tony Judt's essays, H is for Hawk by Helen McDonald. For films, Timbuktu, Leviathan, Tangerine, Ida, Birdman and Boyhood. PC: Rachael Price – from Lake Street Drive, The Woods Brothers, Fatoumata Diawara, James McMurtry, and always jazz (be-bop) and Dylan. PC: Great? Anna Karenina. Should be great? Light Years by James Salter and A Story as Sharp as a Knife by Robert Bringhurst. Q: What’s one thing you’re a fan of that people might not expect? PC: Country music, welding and my 1952 Dodge Power Wagon. PC: Bachelor rice and chopped chicken fried up watching Justified or Newroom or Episodes of Veep or House of Lies on TV. 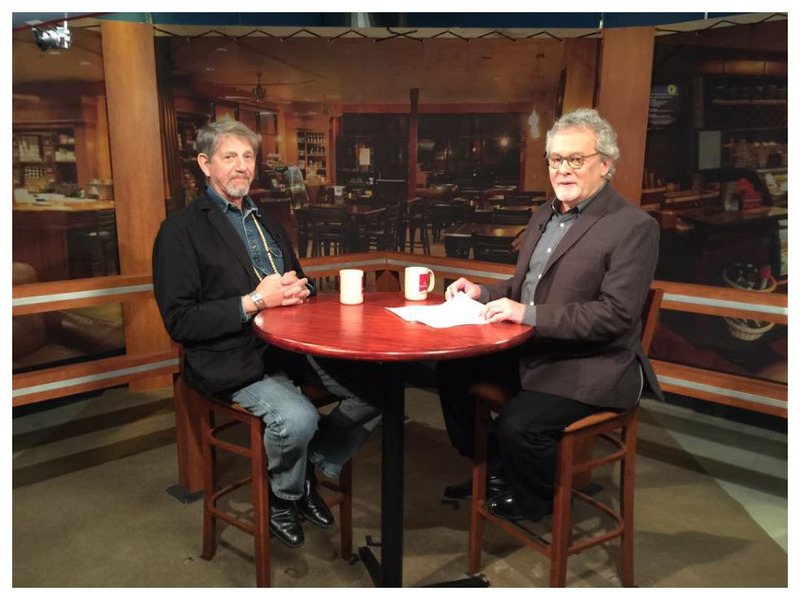 Seattle's Well Read TV show, hosted by Terry Tazioli and Mary Ann Gwinn, invited Peter to be their guest when he was in town last month. You can access the interview video at this link. 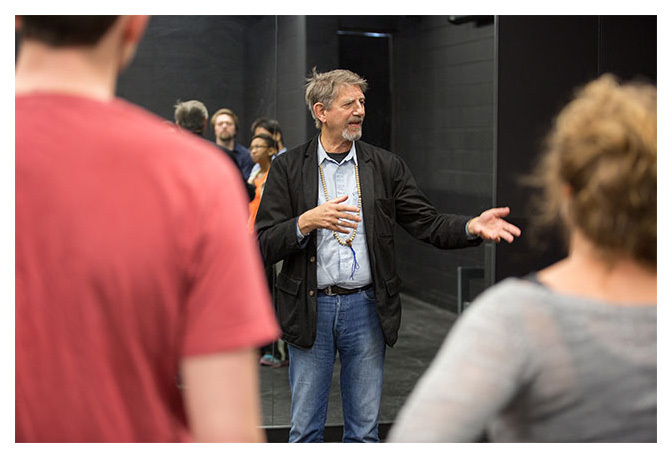 The McIlroy Family Visiting Professorship in the Performing and Visual Arts sponsored Peter Coyote over the past week to have him teach classes at the University of Arkansas. Established in 2006, the professorship invites professionals in certain areas to teach and mentor students. Peter shared, "To be kind of given an endowed chair at a respectable university in the William Fulbright College, who was one of my political heroes, was very moving to me." 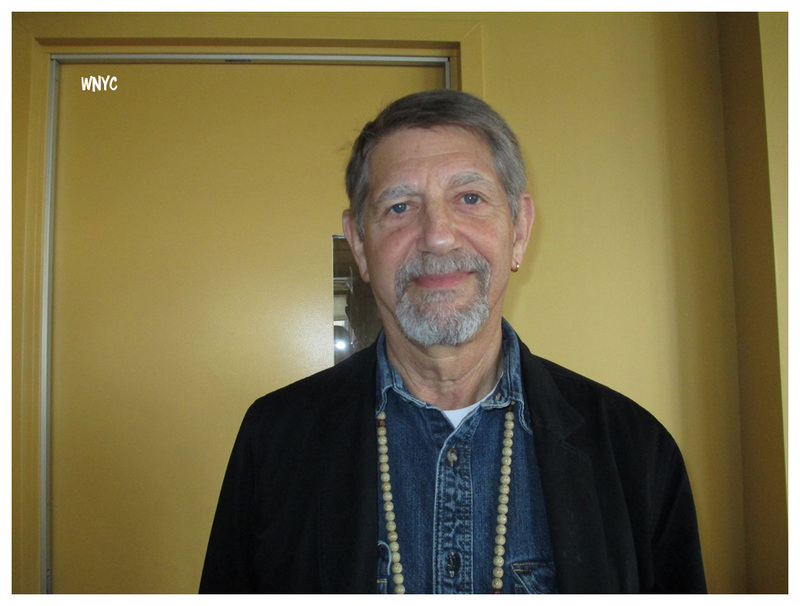 He has already taught classes that have to do with nonviolence, Buddhism, urban politics and performance studies. 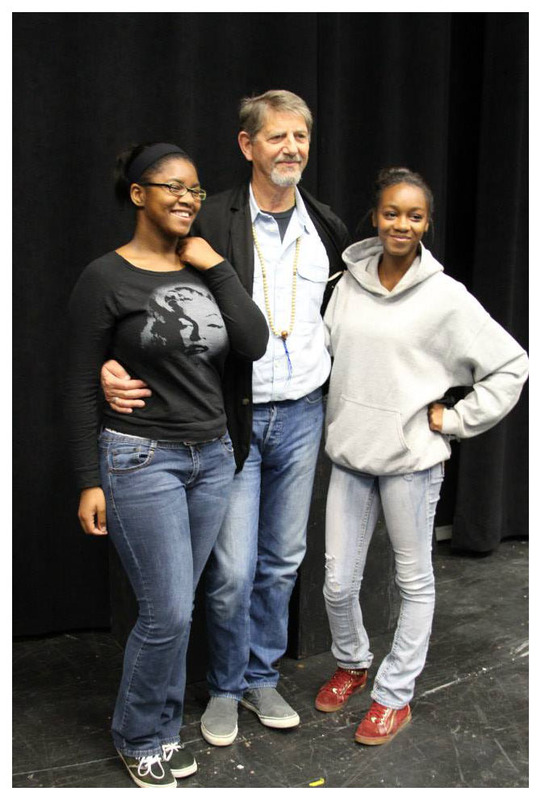 He gave students tips on finding an agent, taking auditions and resisting intimidation with the people they may come across. "I told students about a friend of mine who has a technique of having all of his students wear a piece of hard candy in their underwear just so they have a secret," Peter said. "That way they’re not too worried about what the guy on the other side of the table is thinking about them." As he teaches classes, he tries to use his Buddhist practices to bring wisdom and insight to any issue he talks about with students. In addition, he said, "I try to be as loose and as loopy as I really am because I want young people to understand that it’s not only okay, but it’s critical to be who you really are." 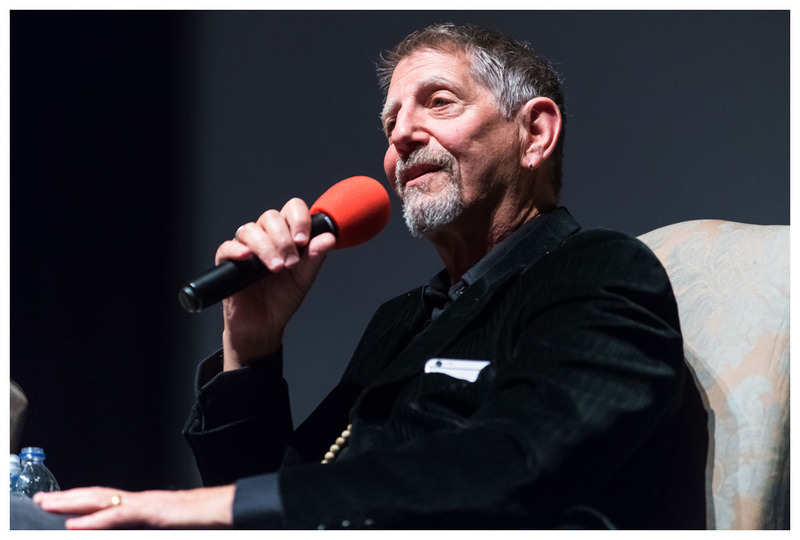 Peter Coyote visited Fulbright College in April through the generosity of Hayden and Mary Joe McIlroy and the coordination of a core group of alumni and friends. This acclaimed author, actor, and keen observer of political and social conditions was on our campus for a full week giving wide-ranging lectures on Buddhism and nonviolence, urban politics and social engagement, story telling, documentary production, acting, and survival in a creative environment. 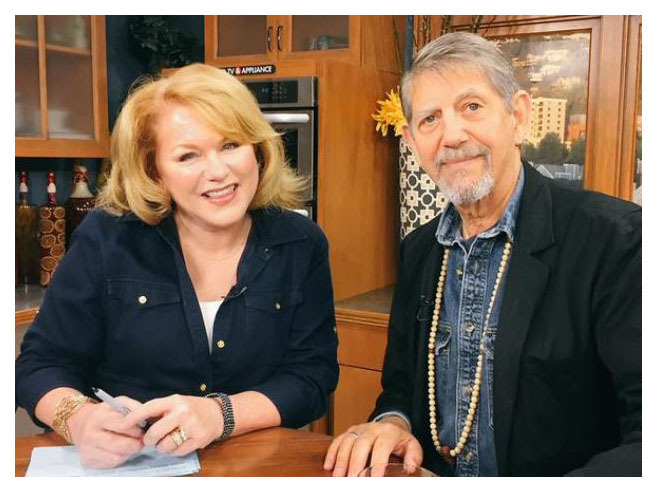 We rarely have a single guest who has experience with such a wide array of subjects. One of our priorities in Fulbright College is to share ideas, new concepts, and acclaimed thinkers with the public. 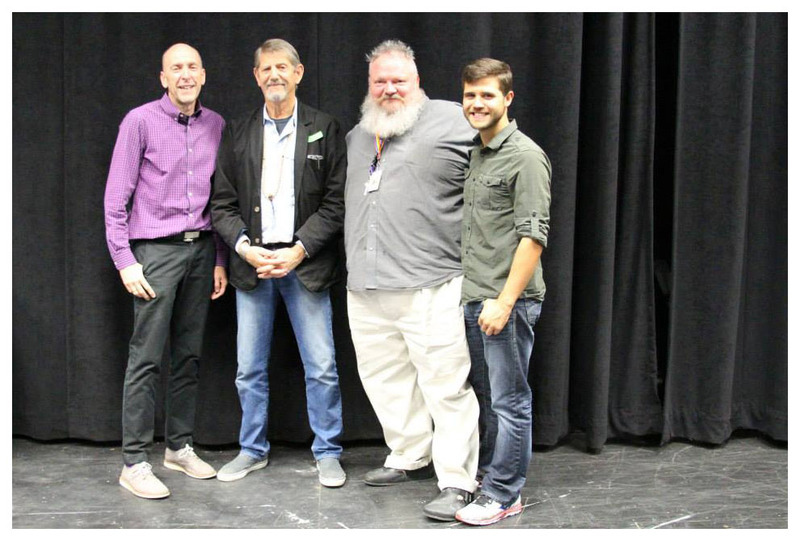 Given Mr. Coyote's breadth of knowledge and generosity with his time, we were able to bring together students, alumni, the community, and others during this amazing week. Of course, we also like to show off our community when friends come to visit. 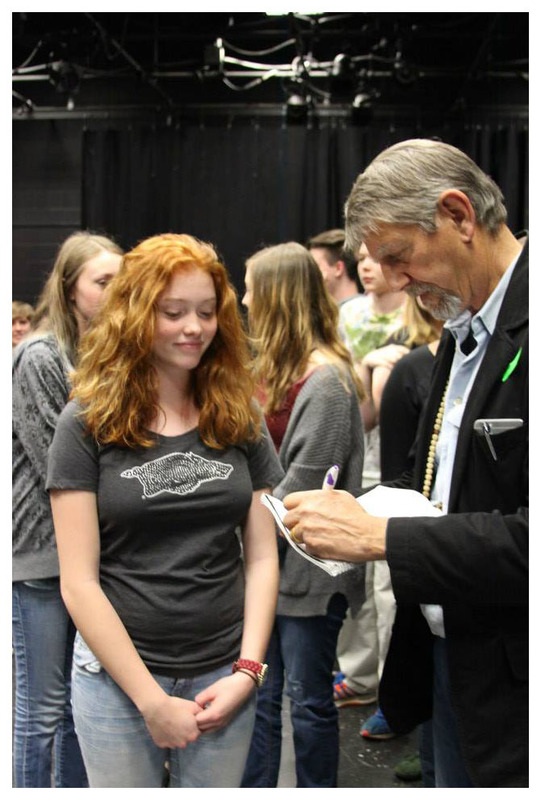 In addition to his time at the University, he also spoke with drama students at Fayetteville High School, toured TheatreSquared and Crystal Bridges Museum of American Art, cooked with the owners of The Farmer's Table, led a three-hour writing workshop at the Fayetteville Public Library, and gave interviews to the Pryor Center for Arkansas Oral and Visual History and KUAF's Ozarks At Large. 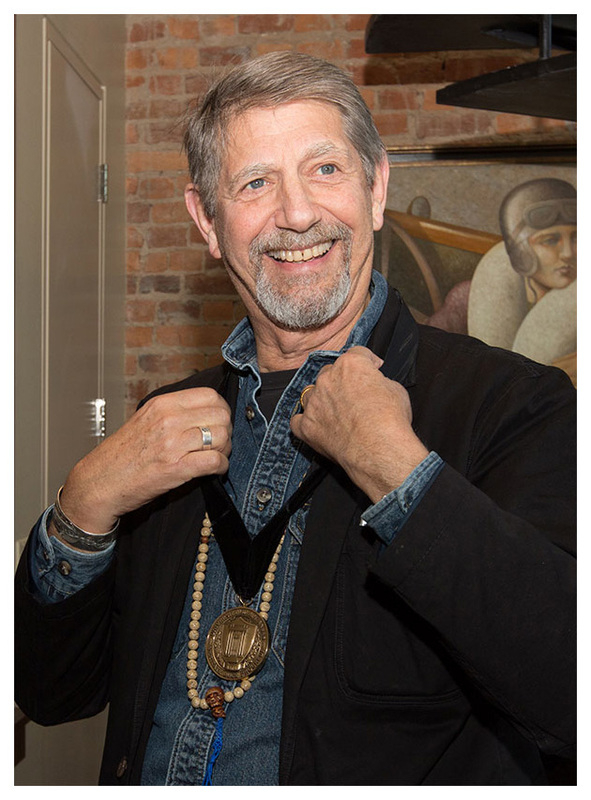 During some public remarks, he commented that he was moved to have had this opportunity to serve as a McIlroy Family Visiting Professor in the Performing and Visual Arts. He mentioned his affinity for Senator Fulbright - one of his political heroes - and the respect he had gained for the University. Visits like this are essential for our students. Exposure to new, and sometimes famous, guest scholars opens their minds to new possibilities, allows them to see how their classroom experience will apply to their lives and careers, and inspires their intellectual growth. We are fortunate to have partners like the Fayetteville Public Library and donors like the McIlroys who made Mr. Coyote's visit possible. We look forward to bringing you updates on other campus visitors. 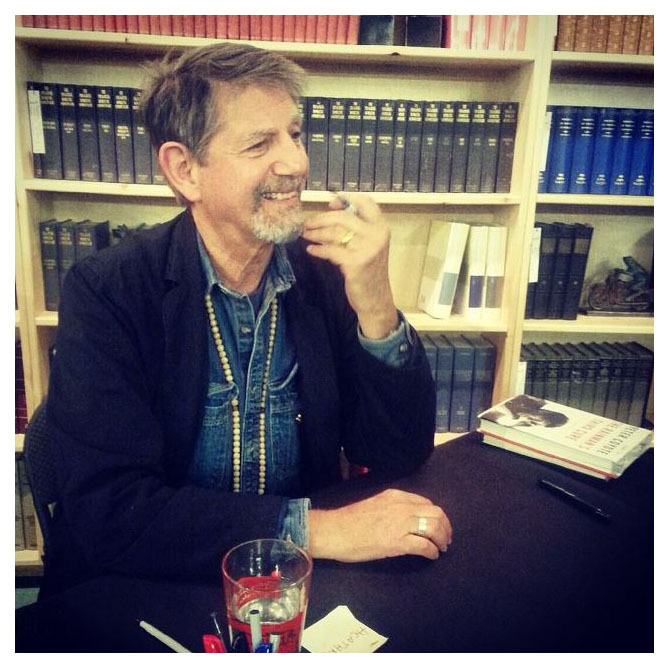 In the mean time, I encourage you to listen to Peter Coyote's KUAF interview. In Rainman, Coyote takes us way back to the beginning, starting with a turbulent childhood that left him searching for mentors (and lovers) wherever he could find them. From the Jewish immigrant world of Manhattan to student protests in Washington D.C., from communal living in Haight-Ashbury to the Paris apartment of Roman Polanski, Coyote's life often reads like fiction. But the reality is that he only barely survived it - especially the twelve years he spent using heroin. 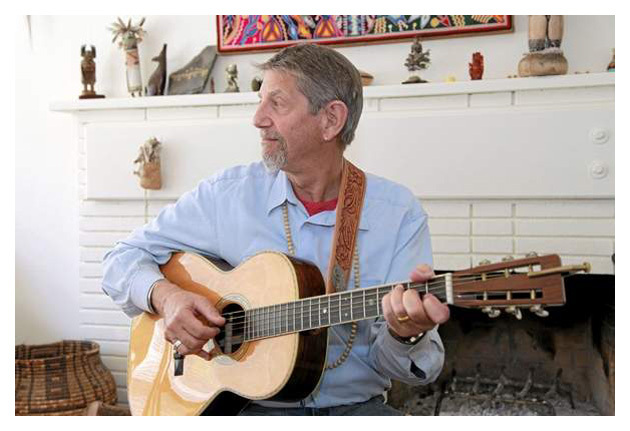 "Last February was the first time in 45 years I've been free of Hepatitis C," he says with much relief. "It took me quite a while to put myself back together." 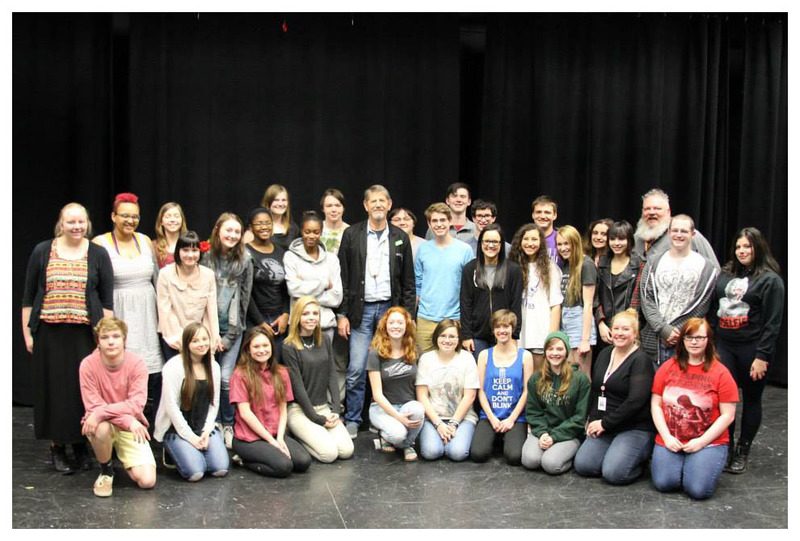 Drama students at Fayetteville (AR) high school enjoyed a visit from Peter this past Tuesday. 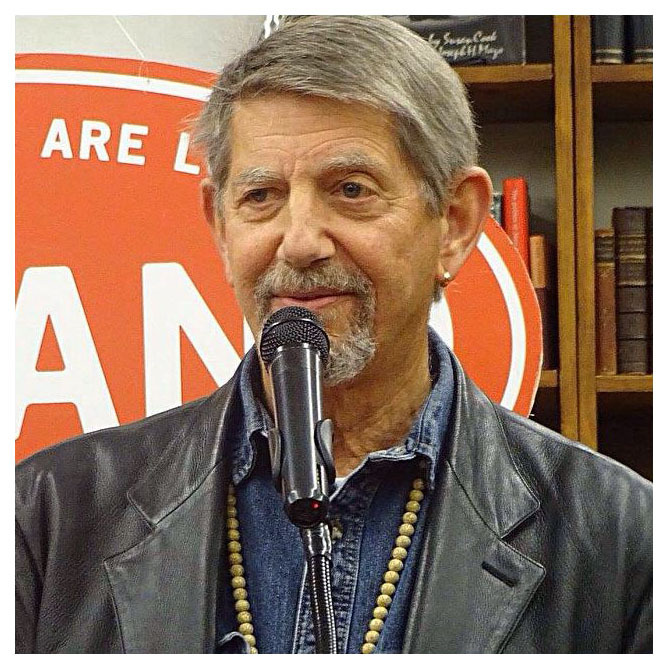 He will also be a special guest for the Author Series tonight at the Fayetteville Public Library and tomorrow the library will host a free "Art of the Memoir: Writing Workshop with Peter Coyote" at 9 a.m. Here are some photos taken on April 28th. 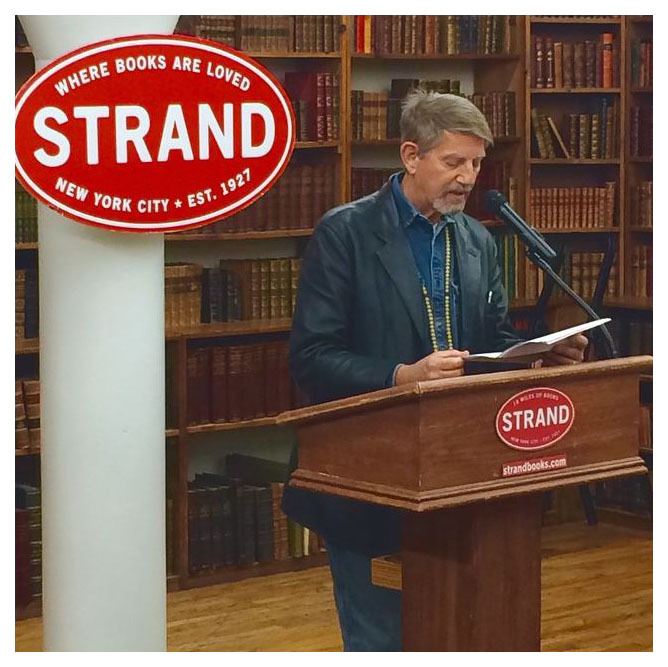 You can access Peter's talk via youtube.com at the Strand bookstore in NYC on April 23rd. 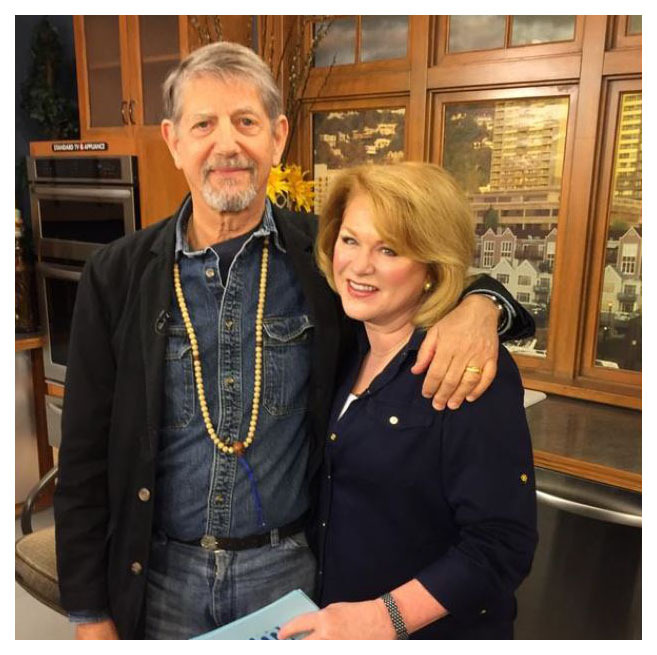 Here are another couple photos taken on April 20th in Portland with Helen Raptis on the AM Northwest show. And on the same day Peter did a signing at Powell's City of Books. 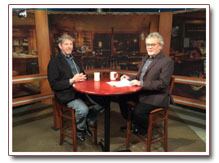 Here are two new video interviews as Peter continues on his book tour. 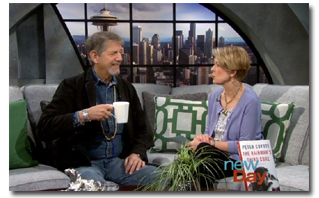 The first photo link will take you to Seattle's New Day Northwest show. The second one is a Portland interview. 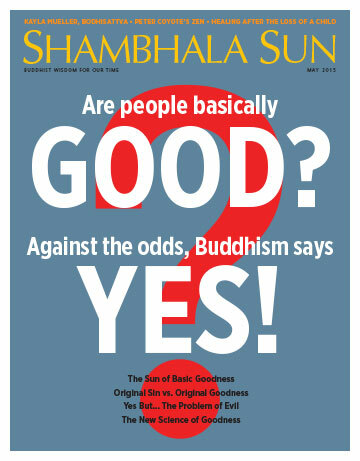 You can also access an excellent interview published today by the Pacific Sun. 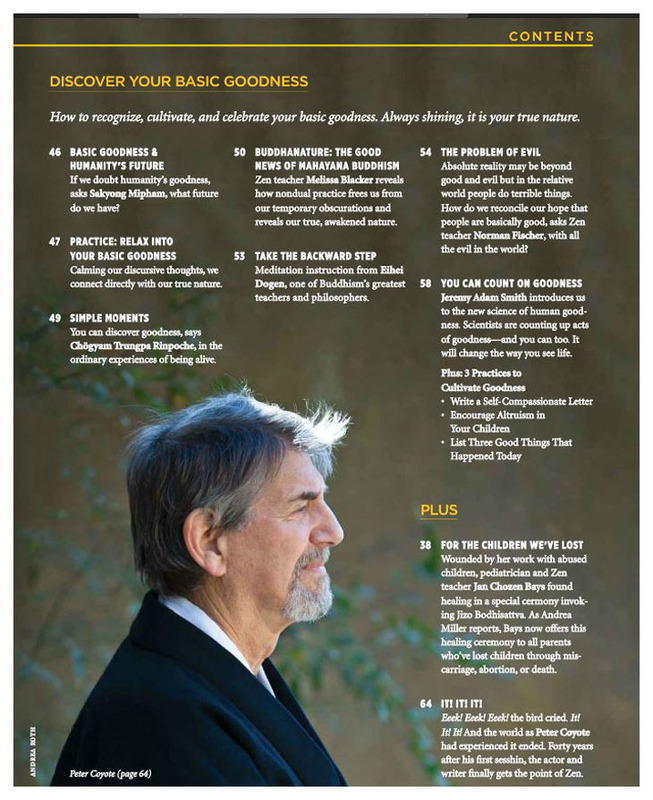 There are two new interviews with Peter related to his book, THE RAINMAN'S THIRD CURE. 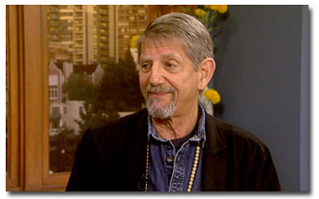 The first one is from The Oregonian called "Peter Coyote talks about his spiritual path from the Sixties to 'E.T.' 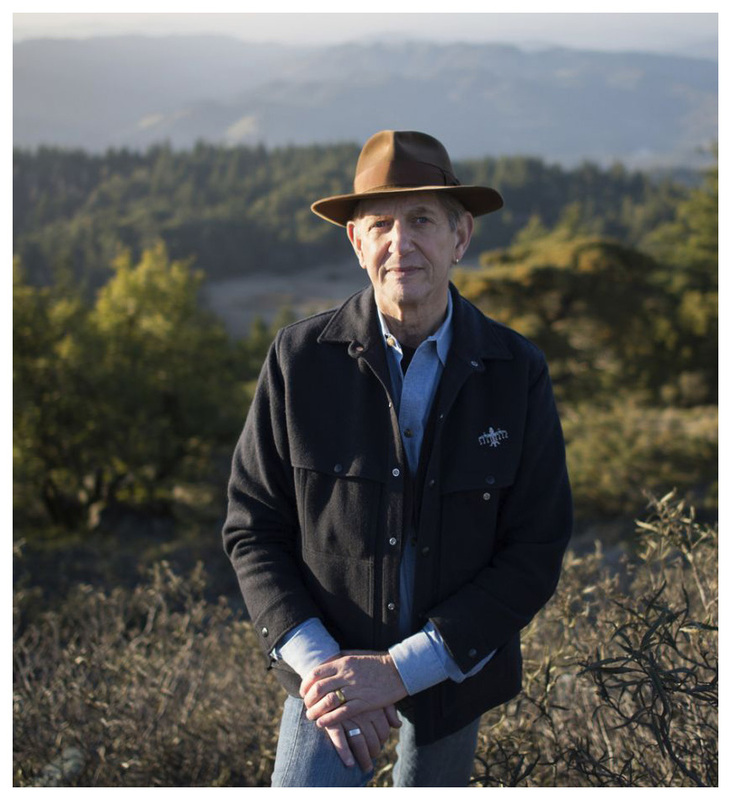 and Zen Buddhism" and the second one is from Marin Independent Journal called "Actor Peter Coyote’s second memoir honors the mentors who helped shape him". Enjoy! The photo below was taken in his apartment but I believe he has now purchased a new home. Here's a link to a youtube video of Peter as he joins Carl Dix, Cornel West, Eve Ensler, Cindy Sheehan, Alice Walker, Arturo O'Farrill and the families of nearly thirty police murder victims in calling for the April 14, 2015 nation-wide mobilizations to STOP MURDER BY POLICE. 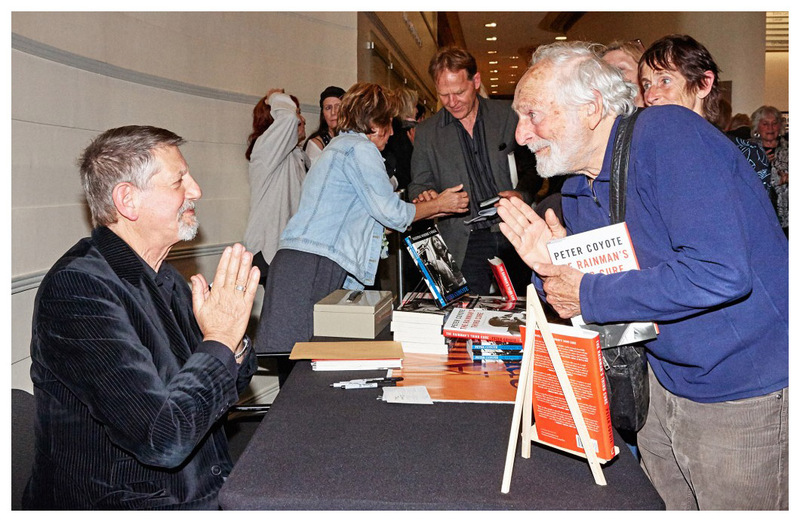 Jonah Raskin of the San Francisco Chronicle has written a notable review of Peter's new book. You can read it here. I particularly liked this paragraph - "Perhaps best known as the narrator of many documentaries, among them Ken Burns' The Roosevelts, Coyote has emerged, over the past few decades, as the unofficial yet authentic voice of America. His own personal voice echoes across every page of his memoir. It also speaks for the lost, the lonely, the doomed and the redeemed. Why Coyote says nothing about his work with Burns isn’t clear; perhaps he’s saving it for another book, or doesn’t think it’s essential." 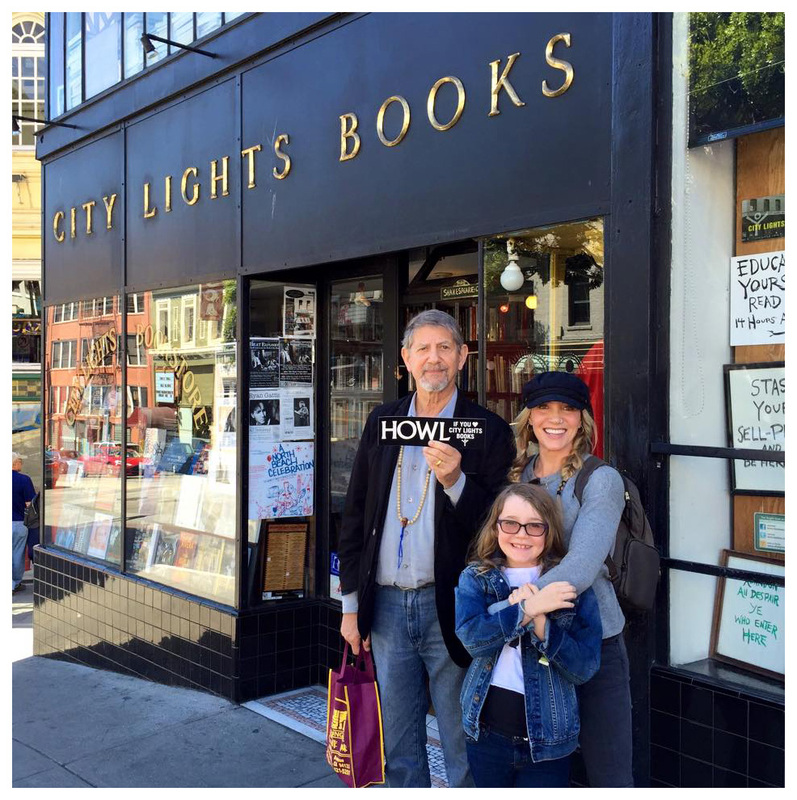 Here are a couple photos taken this week of Peter at City Lights Books in SF. In the second photo he poses with his daughter and granddaughter, who were visiting from Utah. 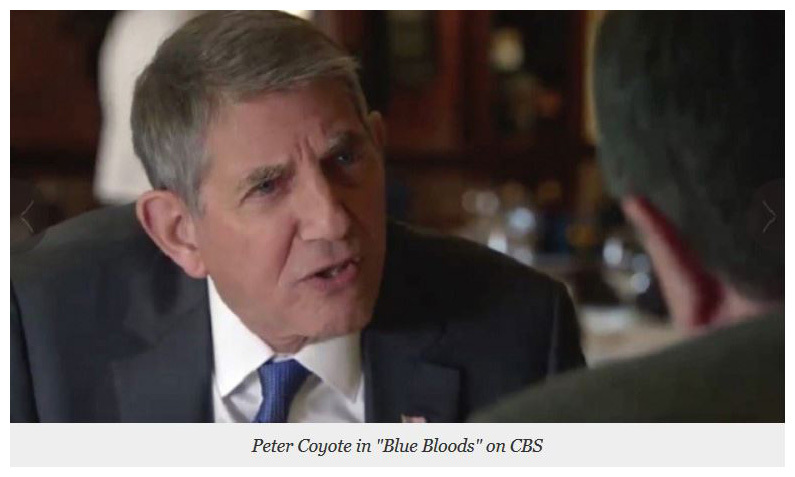 Peter will guest star in Friday night's episode of "Blue Bloods" on CBS. He will play Senator Ted McCreary, who asks his longtime friend, Frank Reagan (played by Tom Selleck), to help make a DUI go away, leaving Frank facing a moral dilemma. Frank D'Angelo's new film NO DEPOSIT will have its world premiere April 24th in New York City's Greenwich Village at the Quad Cinema, 34 West 13th St., (www.quadcinema.com) during an exclusive one week engagement. The 14 track album soundtrack for the movie launches on iTunes April 28th.